Paul Gregroire and Herby Sanon. Ted Oswald. Herby Sanon is thriving in the Delmas 33 section of Port-au-Prince, Haiti’s bustling capital city. Yet it wasn’t always this way. He was born in Saint-Louis de Sud, a small, seaside town in Haiti’s south. In his youth, his parents fished, farmed, and did domestic work to support Herby and his six siblings. His family’s resourcefulness afforded the opportunity to get a foundational education, but he ran into a ceiling: to fulfill his dreams of advancing to university, he had no choice but to move elsewhere. Pooling together their meager resources, Herby’s parents wagered on sending their second-to-last son to school three hours away where an aunt agreed to house him. At the age of 19, Herby left for the ever-expanding metropolis of Port-au-Prince. The beginning of Herby’s story is like millions of others, both in Haiti and around the world. Over the past few decades, decreasing agricultural production, unfavorable trade policies, poor quality education, and extreme poverty have created a rural exodus from the countryside into Haiti’s cities – Port-au-Prince being a chief destination. In 1970, a mere 20 percent of Haiti’s population lived in cities, rising to 60 percent in 2013. In the period from 1982 to 2010, Port-au-Prince’s metropolitan area swelled from 800,000 people to 2.8 million – over one-quarter of the country’s 10.6 million population. Port-au-Prince, like many large cities in the Global South, is ill-prepared for this kind of growth. Municipal infrastructure is non-existent in some neighborhoods. Port-au-Prince also lacks space. It is bound by the ocean and a mountain chain limiting the land available for expansion. Newcomers inevitably stay with family or seek low-rent houses built in areas prone natural disasters. This type of unregulated growth contributed to the destruction witnessed on January 12, 2010 when a 7.0 magnitude earthquake hit Port-au-Prince and killed more than 220,000 people, leveled 300,000 homes, and sent 1.5 million people into makeshift displaced-persons camps. This is when Herby’s life changed radically. “When I came to Port-au-Prince, it was not a good life for me,” Herby says. In the three years before the earthquake, Herby settled into a grinding daily routine: walk two hours to reach school by 8am; return home by 7pm; study late into the night; then crash from the fatigue. His aunt was just as busy, working long days at a factory. When his house was damaged by the quake, Herby settled in Izmery Park, a nearby soccer field-turned tent encampment. He began to volunteer, managing a composting-waste sanitation program introduced by an international organization called SOIL. His volunteering eventually led to a job. Educating communities on sanitation tapped into Herby’s passion to serve others and contribute to Haiti’s development. 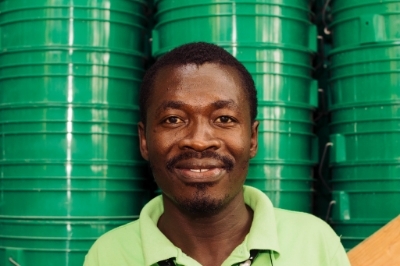 Over five years later, he manages SOIL’s composting-toilet social business and is able to send his family members weekly support, including enough to help his mother build a new home. He is a source of pride for both his communities – Delmas 33 and Saint-Louis de Sud – and the type of success story that works like a magnet to pull others to the capital. “I had a vision. I was going to finish school, and find work. Come what may, I was going to succeed.’’ Herby Sanon, now 28 years old, works for an international NGO specializing in community sanitation and composting toilets. Ted Oswald. But Herby’s success is not the norm. Most migrants in Port-au-Prince work hard for meager and sporadic earnings. Indeed, 70 percent of the national population earns less than the daily minimum wage of US$5.11. Take Paul, for instance. Like Herby, Paul comes from a coastal town in southern Haiti. At the age of 11, he was sent to live with a cousin in Port-au-Prince and soon after began work as a mason. Thirteen years later, he is still just getting by. “The only thing I like about Port-au-Prince is the work,’’ Paul says. In some seasons, Paul can work consistently for a few months at a time, but right now, he has gone two months without any leads. He relies on friends to call him when they learn of jobs, and his other four siblings who have also come to the city to make ends meet. Paul hasn’t re-created ‘’home’’ or established close community connections. He lives alone, and admits to keeping to himself most of the time, staying “off the streets’’ so as to not fall in with the wrong crowd. Despite the challenges faced in big cities, leaving is unrealistic. Paul admits he would return to Belle-Anse in an instant if there was stable work, but the fact city-dwellers find opportunities more often and earn 20 percent more than their rural counterparts for the same jobs anchors him in Port-au-Prince. For Herby, it is much the same. Though he loves his job with SOIL and his new community in Delmas 33, he hopes to return home, but only as a place to retire and start a community enterprise once he has earned enough money, gotten married, and raised a family in the capital. Haiti’s countryside remains at the heart of Haitian culture, tradition, and imagination. Society will continue to struggle with the cultural and familial disruptions that rural-to-urban migration creates as new waves of people like Herby and Paul leave their homes, hoping to make the elusive opportunities they seek a reality. This was re-posted from the MCC LACA blog.